One could say we had a field day on May 24th when the topic for the afternoon was “Sport”. Indeed one poem was about a school Sports Day, and another about a country show. Cricket won the count with five poems related to this game, including, of course, Newbolt’s “Vitai Lampada”, the breathless hush and all that. Next came golf and tennis ( and yes, Betjeman featured in both of these), while after that came a parade of sports familiar and ingenious. We were treated to: an exciting game of ping pong, a memorable defeat at baseball, sea skating, bull fighting, croquet and curling to mention but a few. By the end of the day we were exhausted but had been thoroughly entertained. This entry was posted in Ripley Arts Centre, Shortlands Poetry Circle and tagged Betjeman, Henry Newbolt, Nola Turner on June 11, 2016 by shortlandpoetrycircle. Members came to the meeting well-prepared to read poems by Ruth Padel and Ruth Fainlight, two very prolific and accomplished contemporary poets. Ruth Padel is a poet, novelist, conservationist, critic and first Writer in Residence at the Royal Opera House in Covent Garden. She has published nine poetry collections. Ruth is the great-great granddaughter of Charles Darwin and in our meeting several members read from her collection Darwin: A Life in Poems, especially pertinent as we are not too far from Darwin’s home at Down House. Ruth Fainlight is an award-winning poet and translator who has published thirteen collections of poetry. Her work has spanned five decades and she is known for writing about apparently ordinary things while investing them with greater significance. Many people in our group came along with her poem ‘Handbag’ in case there was a chance to read it but, knowing it would be a popular choice, made sure they had others. Our choice of poems was pretty well equally divided between the two poets – unplanned felicity or did some members make a conscious decision to divide their time between the two? This entry was posted in Poetry Events, Ripley Arts Centre, Shortlands Poetry Circle and tagged Ruth Fainlight, Ruth Padel on June 7, 2016 by shortlandpoetrycircle. Many congratulations to Isabel Bermudez. After the success of her pamphlet, which went into a second printing, she is now about to have her first collection published by Rockingham Press. The launch will be in the Autumn. Watch this space. This entry was posted in Member Profiles, Shortlands Poetry Circle and tagged Isabel Bermudez on June 7, 2016 by shortlandpoetrycircle. Beckenham Wordfest on Beckenham Green Saturday 11th. July 12 noon to 4pm. A celebration of the written and spoken word, from the Alice In Wonderland tent to a poetry slam on the main stage. There will be a Heritage Recipe Book, a Quotation Quilt and doubtless some fabulous entries to this year’s Edible Book Competition. This entry was posted in Poetry Events, Shortlands Poetry Circle and tagged WORDfest Beckenham on June 7, 2016 by shortlandpoetrycircle. To be held at St. George’s Parish Church, High Street Beckenham, Kent BR3 1AX. A selection of events again this year with some very well known headline acts. ’Shakespeare’s Greatest Hits’ is on Thurs. 23rd. June at 2.30pm. – a commemoration of the 400th. anniversary of Shakespeare’s death in voice and verse featuring Lance Pierson, soprano Belinda Yates and pianist Heather Chamberlain. 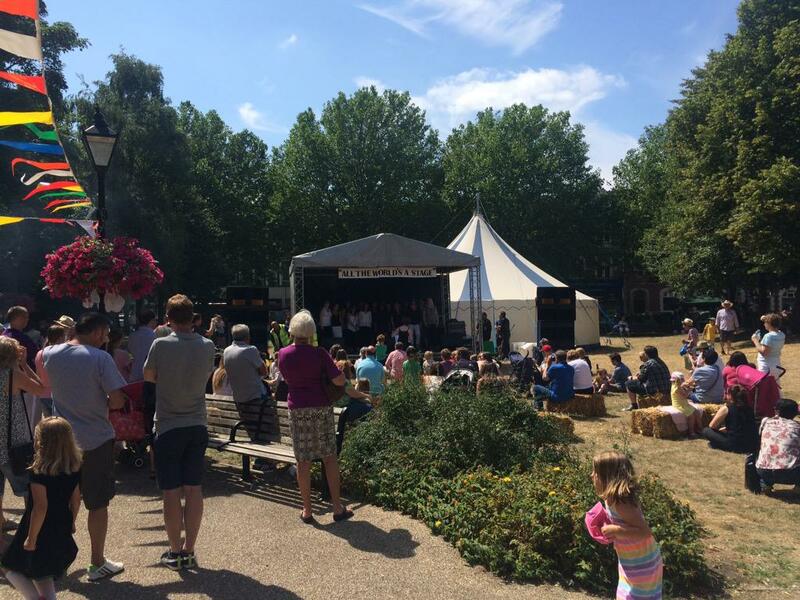 This entry was posted in Poetry Events, Shortlands Poetry Circle and tagged Beckenham, St Georges, St Georges festival on June 7, 2016 by shortlandpoetrycircle.